The Absorb Drain Warden helps you meet drainage discharge guidelines by absorbing oil and retaining sediment from water flowing through it. 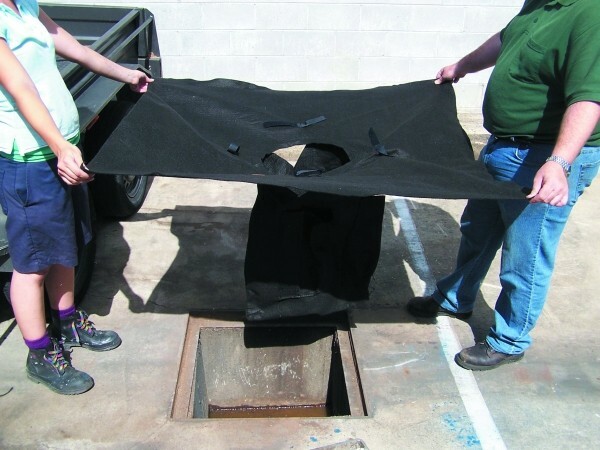 Insert it beneath the grate of your storm water inlet to give you erosion and pollution control. The polypropylene fabric traps contaminants. The oil absorbent boom will not deteriorate or release absorbed hydrocarbons. If the filter fabric becomes contaminated with hydrocarbons, the mini-boom captures them but allows water to escape. Sediments and heavy solids settle and are contained in the bottom of the Warden. It can hold up to 20 litres in an emergency spill, giving you time to put in place your spill response and block drain outlets. The Drain Warden can be cut to fit smaller drain widths. The standard Drain Warden has a drop of 600mm, for shallow drain pits an alternative size is available with a drop of 250mm. • Protecting the storm drains from low level contamination. It assures more response time for larger spill emergencies. • It will only remove hydrocarbons and particulates from stormwater run off. For water-based liquids and hazardous chemicals try our Hazchem booms. • Maintain the Warden to remove particle contaminants. • The Warden restricts the flow rate into the drain slightly.